The Kerala mural tradition of the medieval period, at least 400 years old, retained elements of the great classical wall painting traditions. By 20th Century it slipped into oblivion and most of the sites were obliterated through damage or repainting. This lavishly illustrated book is the first comprehensive effort to document a vividly colorful tradition to enrich Indian art history. Artist A Ramachandran has been repeatedly visiting the major and the more obscure sites for close to 50 years to record, study, and visually document the complex narrative and iconographic tradition. Beginning as a student in Santiniketan, Ramachandran was undeterred by the difficulties of photographing, paucity of source material and the disappearance of the living tradition. The author discusses among the scores he has studied the best representative sites showing stylistic changes. He compares various styles, analyses material and technique from an artist’s point of view and correlates it with other visual and performing arts. The thoroughly researched book is enriched with nearly 400 colour plates, maps and site plans which act as a key. 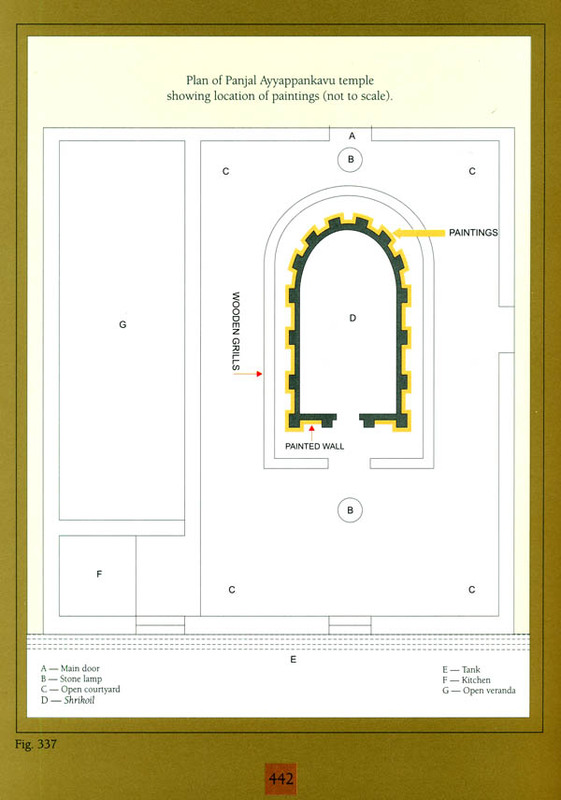 Although the author’s area of study is Hindu paintings, he has included a sampling of a unexplored parallel stream of Christian mural art by adding a study of three churches as this painting tradition is unrecorded and needs further research. The well-known artist and writer A Ramachandran grew up among the temple murals of Kerala. But he began to look at them with the inquiring insight of a scholar following his exposure to the art traditions of India and the world as a student of Kala Bhavana, Santiniketan. He realized the urgency of documenting the existing murals to save them from oblivion. Following a research project of the Visva Bharati University in the early Sixties, Ramachandran regularly visited the major and the more obscure sites for the next 40 years. He has written this book with profound scholarship in spite of his busy schedule as a painter and sculptor. And he has brought to the study the aesthetic understanding and the sensitive eye of the artist. Ramachandran’s repertoire as a writer includes delightful children’s stories, imaginative autobiographical pieces and perceptive art historical essays. Ramachandran, with his wife Chameli, lives and works in Delhi. The present volume is dedicated by Shri Ramachandran to the pictorial language of his ancestors. It has `filled.hin1with its fragrance, penetrated the blood in his veins’, and, ‘flowed out of his veins to the tip of his brush', and, it the tip of his pen. 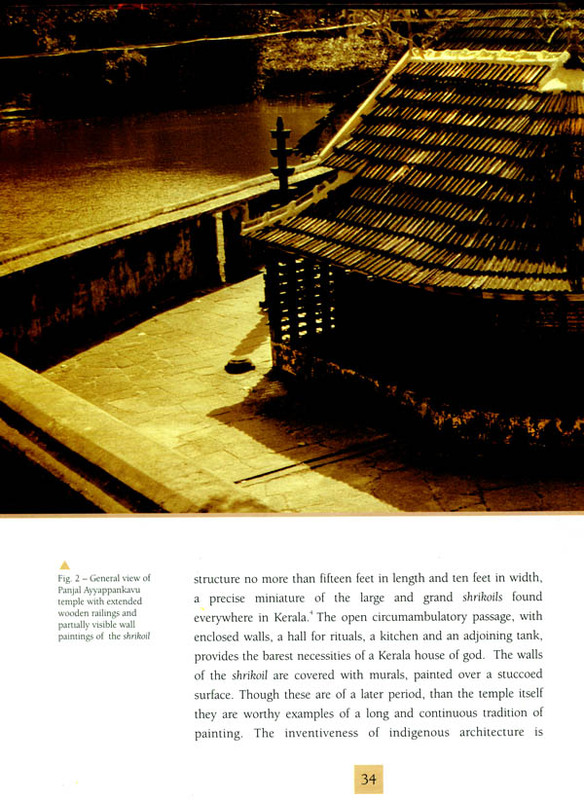 As visible in his picturesque narrative as in his pictorial vocabulary, the author has painted a veritable Kalamezhuttu, using words and images. The author has recreated, in opulent illustrations and vivid descriptions, the lush exuberance of vegetation and organic forms, full blooded, hour glass female bodies, psychedelic vibrations of heraldic colors, the flowing, dynamic, binding line, integration of painted 2D and 3D sculpted and architectural surfaces, volumetric highlights at edges and transitions, flesh tones resembling ‘fresh areca nut sheath' or ‘fresh cut golden turmeric’, and the decorative splendour of stylized figures and forms in Kerala murals. 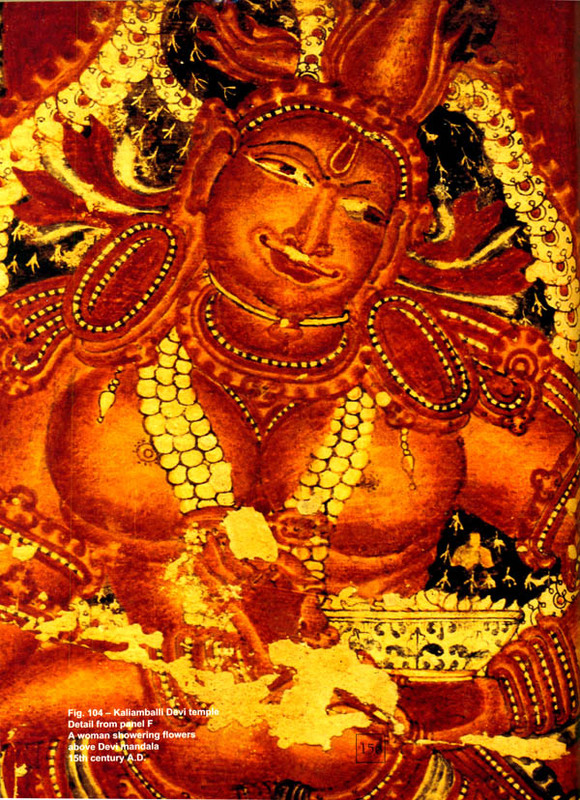 He looks back from the awkward effete realism, insensitive modelling, abrupt flat gaps, loose floating figures and trees, hermetic frames, syncopated contours, beaded frames and mundane decoration if l9th century Kerala murals, formed under European influence, to the stylized sensuousness of nature in precolonial murals. 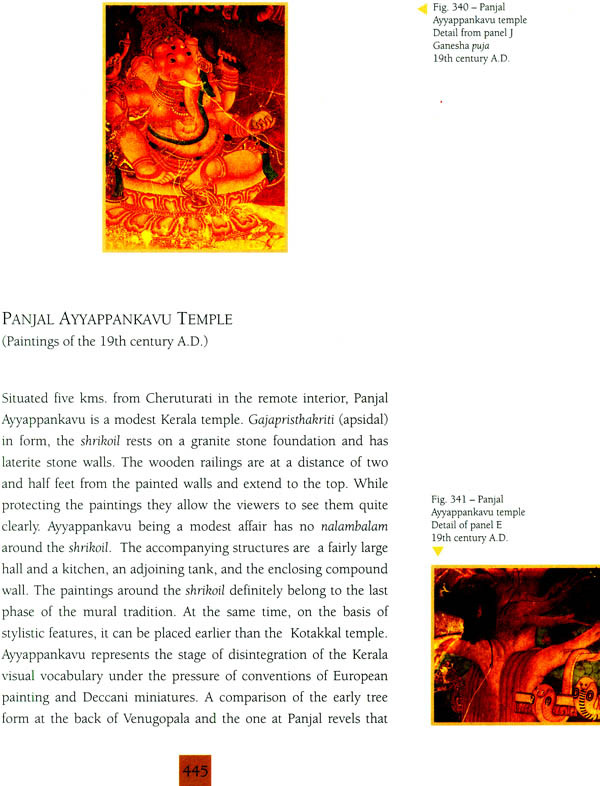 The author describes with agony how the few surviving precolonial murals are being systematically destroyed by relentless renovation and retouch, by zealots, ignorant of the pristine code, the varnavidhikal, by synthetic enamel paint, cheap chemical powder, varnish, whitewash, graffiti, and, by oil and soot, deposited by incessantly burning lamps. Shri Ramachandran had seen the procession, of Gods in Attingal, his birth place. He had witnessed the Ettumanoor temple Nataraja in the swing and sway of the Saptaparni tree in front of his Kalo Bari (black house) in Shantiniketan. He had looked nostalgically at the relief sculptures on Kalo Bari walls, modelled on Mattancheri palace murals. Gaudia Lohars, Bhils, Jadu Patuas and Santhals, his mentors Nandalal Bose and Ramkinkar Baij, Mexican artists Orozco, Riviera, Sigueiros had helped him to abstract an essential visual code from nature, see the world beyond logical structures and to transcend the western manner of light and shade, cast shadow and perspective. The plants and trees, insects and flowers, the anatomical and figurative, the darkened edges and luminous flesh have entered his work from this legacy. He has defied the westernizing trends of abstraction to embrace and expressionistically reinterpret his tradition. ‘Unlike the proverbial Brahmin, he won’t give up his goat, even if it was called a dog'. Students of Indian art are well aware of its profuse richness expressed in the numerous distinct regional idioms that flourished throughout the subcontinent during any of the great periods into which the history of its art has been organized. The region of Kerala, located in the southern extremities (roughly identifiable with the present day state of the same name) also possessed, like its neighbours, particularly Karnataka, Tamilnadu, and Andhradesa, a major artistic tradition but one which has received less scholarly attention than it deserves. This is particularly true of the painting produced there, partly because of the absence of appropriate documentation and publication of the basic materials and possibly due to the seemingly overwhelming complexity of what has survived. Photography of mural paintings is always a challenging task, and reproductions of Kerala art, particularly in monotone, are often visually illegible. innovative studies, particularly by Stella Kramrisch and her theoretical concept of Dravida and Kerala were not followed up with the enthusiasm one may have expected so that the history of paintings in Kerala remains largely unwritten and our knowledge confined to tantalizing glimpses. As a student of Indian painting, I had always been intrigued by the little I knew of the splendid achievements of Kerala artists, but clung to the faith that there was present here a major manifestation of the Indian genius. I therefore accepted with enthusiasm the kind invitation of Srimati Sara Abraham to participate in a planned survey of the paintings of that state. Sara’s enthusiasm and service to modern Indian art are well known but not her involvement with and encouragement of the study of ancient Indian art resulting in the publication of several works notably Professor Settar’s magisterial volumes on Hoysala art. The participation of Shri A. Ramachandran, the distinguished painter, who had been studying, photographing, surveying and copying Kerala paintings from the I960’s was another temptation. It was a memorable, educative and thrilling journey of discovery as the treasures of Kerala painting unfolded before our eyes every time we traveled from one magnificent site to another. Ramachandrans deep visual perception and masterly understanding of the artist’s craft — together with his sharp humour - made for an easy initial understanding that in other circumstances• would have taken a long time to achieve. 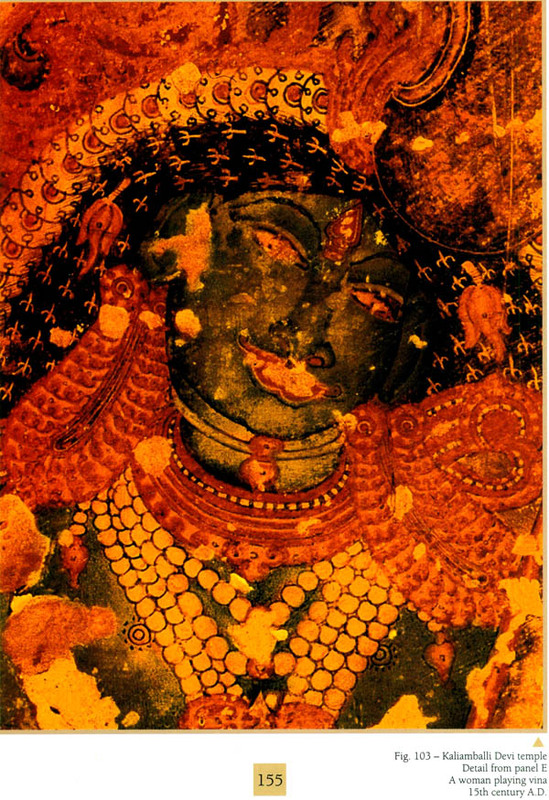 A mere fragment of a painting found in a cave shrine at Tirunandikkara depicting the head and torso of a human figure is the earliest example to have survived in Kerala. 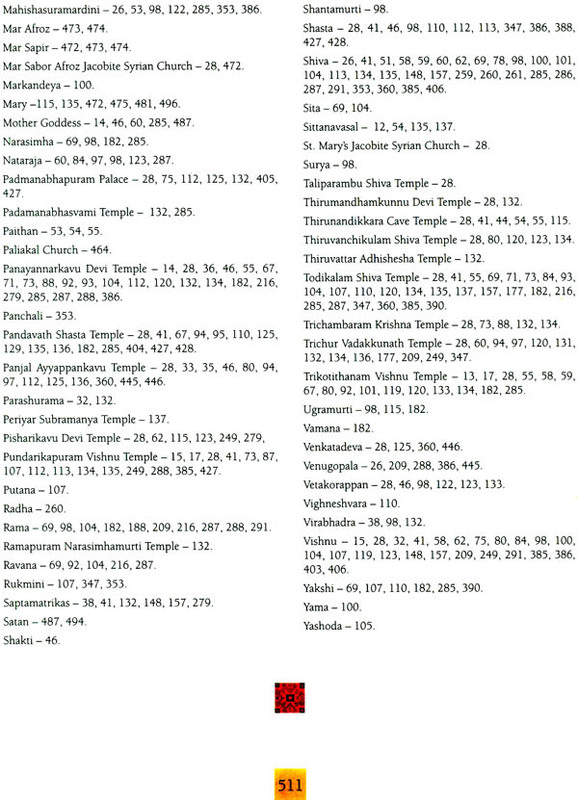 It can be assigned to the 9th century and though it possesses a linear tension not to be found in contemporary work, for example, at Sitranavasal in Tamil Nadu, there is nothing to prevent it from being assigned to the ancient classical tradition the ultimate source of which is exemplified by the classical work of the 5th century as fortuitously preserved at Ajanta and Bagh. It is possible that there was earlier work done in Kerala but of this there is no evidence nor has any work survived till the 15th century When paintings again begin to be found, the style forms part of a pan Indian transformation characterized by a flattening of forms, angularity of line and boldness of colour that it is to be found in medieval sculpture and painting both in the south as well as the north. It is from the period that Kerala paintings present those characteristics that we most commonly associate with it. The roots of this style, it would appear to me, lie in the Karnataka traditions of the Hoysala period, both paying great emphasis on ornament, though the Kerala emphasis is on vigour rather than delicacy. Ramachandrans reconstruction of the history of Kerala art, as it is to be expected in a sensitive and dynamic painter, is based on a visual analysis of form and the help of a very few dated and datable monuments. A particular strength of his study is alertness to the problem of repairs and copies so that he is able to present conclusions that are artistically credible though I am sure that these will undergo some modification in the course of time and larger studies which I hope that this book will inspire. Several earlier scholarly opinions have been questioned and revised and Ramachandran finally emerges with four phases. 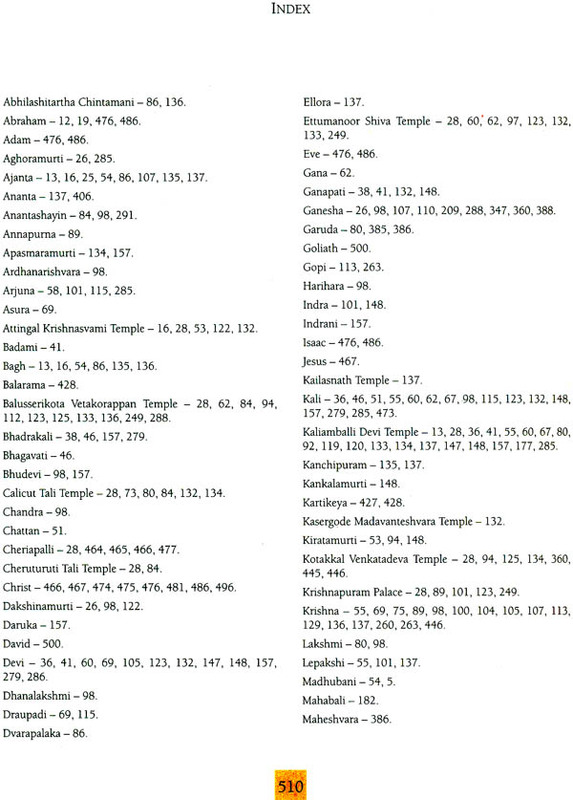 There is the early first phase of the 15th century CE to which belong a very few temples, notably those at Trikotithanam and Kaliamballi. This is followed by a second phase of the 16th century the best example of which is the Ramayana painting in the Mattancheri palace. Yet a third phase begins in the late 16th century characterized by a marked flattening of forms of the type that is to be seen in the Panayannar Kavu temple, followed by the fourth phase which is characterized by him as one of decline and general impoverishment of form. 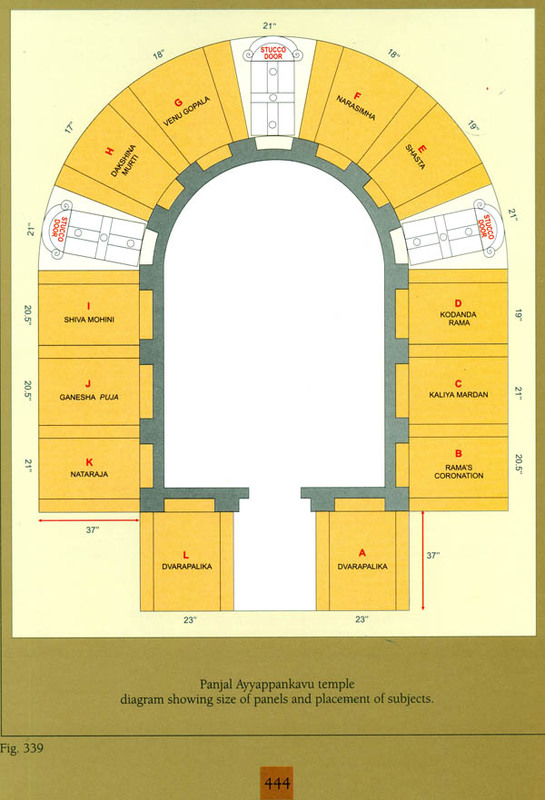 All these phases are illustrated with lavish and detailed photographs and clear diagrams. What is most striking about all these phases is the dramatic nature of the art both in form and feeling (though the drama begins to weaken in the last phase), very reminiscent of vigorous Kerala dance-dramas like Kathakali. In this connection our attention is drawn to the ritualistic Kalamezhuttu image of the mother Goddess made with coloured powder and belonging to the same broad tradition as the wall painting. This image is danced upon by the oracle who wipes it out in the process even as he absorbs its powers. That the same religious impulse was the inspiration of the both dance-drama and painting is obvious in the unfolding of the great narrative painted scenes. These are imbued with its rhythms and partake of its expressiveness, particularly in the rendering of the stylized moods that flit across the faces of both. The compositions of the great narrative scenes of Kerala painting hark back to the ancient traditions of the 5th century and earlier. These seem to be governed by no principles of time and space but are located in a universe where everything takes place in the eternal present. They are crowded with piled up human forms, rendered in highly stylized and conventional manner. In spite of the ponderousness, the modeling is essentially cubical, the line wiry and sharp, in the typical medieval idiom of all Indian art but here endowed with a unique individuality The forms themselves are modeled in the traditional Indian manner, by darkening up the edges and lighting up the centers. This technique is present in every traditional school of Indian painting, except for some work of the colonial period, but is particularly emphatic and compelling at Kerala even in the late phases of its art. Though the human figure dominates, where nature is glimpsed it is rendered with great felicity The stems of plants bursting with sap and the twisting fronds of palms inhabited by birds and animals are rendered with the utmost conviction and felicity These often put us in mind of the vivid rendering of nature to be seen in the great Hamza—nama produced for the emperor Akbar a little after the mid 16th century inanimate objects, in this masterpiece of Mughal painting, are rendered as though they possess the same life that courses through human beings who are themselves seized by an unceasing and dynamic energy Kerala painting, for example at the Pundarikapuram Vishnu temple, has the same vitality and strength, though in another mode. All its multifarious qualities make this regions painting a precious, if somewhat neglected, art heritage of the country Ramachandrans work should go a long way in opening up new paths for the study of this splendid art. It was only in 1957, when I went to study art at Santineketan. that I had my first encounter with the wall paintings of Ajanta and Bagh, copied by Acharya Nandalal Bose and his students They reminded me in some way of the paintings I had seen in my childhood in Attingal on the walls of Krishnasvami temple I started copying these murals whenever I went home for vacation, and with it was initiated my lifelong involvement with the temple paintings of my native land. I began with Kumarasambhava series of drawings from Mattancheri Palace. a part of which I had seen in relief on Kalo Bari, my hostel- residence in Santiniketan. My copies impressed my teacher Shri Biswaroop Bose and he took them to show his father, Master Mashai Nandalal Bose. I still remember the gleam of admiration in Master Mashai’s eyes when he saw the Kumarasambhava drawings. A few years later, in 1962, I was commissioned by Kala Bhavana to make a copy of these drawings for its museum collection. Chameli, a fellow student who later became my wife and partner, joined me in this project. 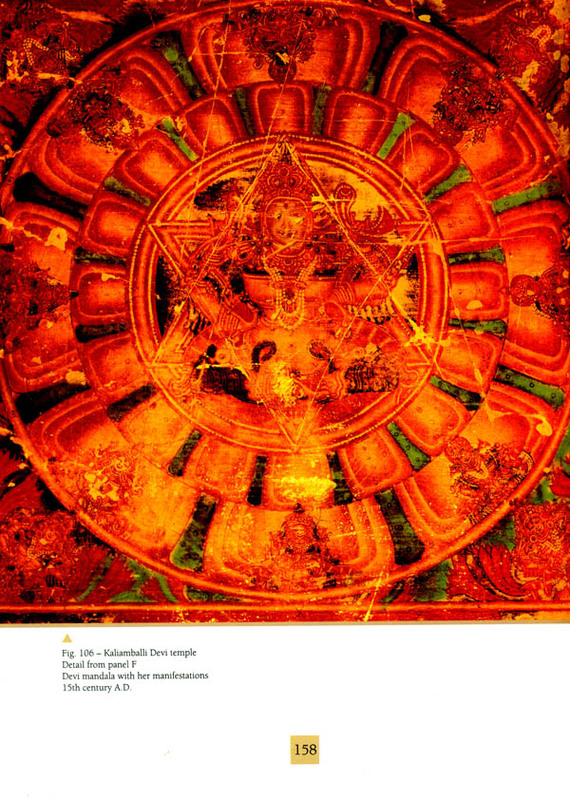 I began to realize the need to carefully research this unique art tradition, thus far relatively unknown and joined Vidya Bhavana as a scholar for the PhD Degree. 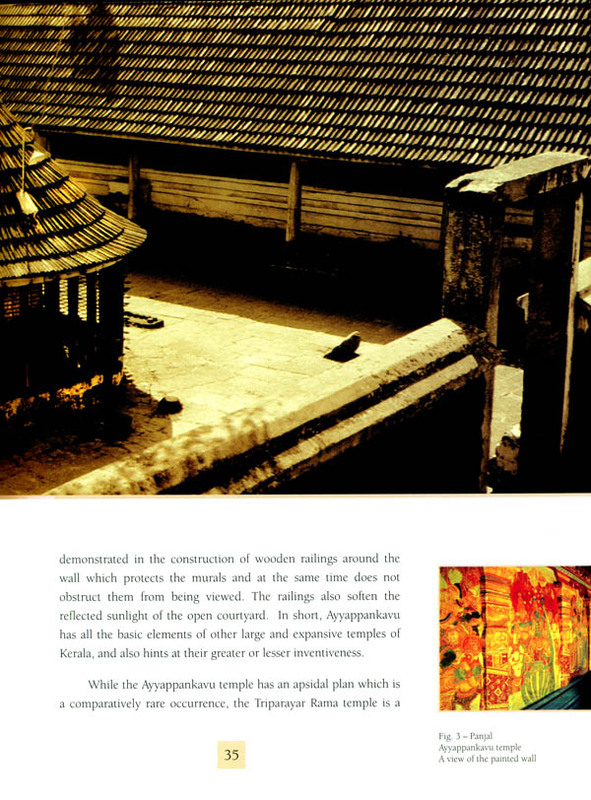 From 1962-64, I traveled throughout the length and breadth of Kerala searching for temples for paintings. With the meager resources at my disposal, my survey would have never been so extensive had l not received the support of so many friends and well—wishers notable among them being Prof. V. Anandakuttan, Shri G N. Sreekantan Nair, Shri G. Aravindan, Shri N. Mohanan, all sadly demised, and Shri V R. Thampi, Shri G. Gopa Kumar and Shri Raman Nambudiri. But this exercise of documenting Kerala murals was not easy Many sites were at remote locations and difficult to access. I often needed special permission to study them. Nevertheless, I managed to survey numerous sites and copy rare specimens. Unfortunately before l could complete my doctoral thesis, economic necessities compelled me to abandon the research and travel to New Delhi. Here l first worked as an artist with Kumar Art Gallery for a year before joining Jamia Millia lslamia as a lecturer in art education in 1965. Seven years later, I was invited by Fukuinkan Shoten Publishers to visit Japan to write and illustrate a few children‘s picture books. I carried with me the copies of Kerala murals I had made from Mattancheri Palace, Trikotithanam, Etumanur and Pundarikapuram temples at the behest of the deceased Professor Fuku Akino, renowned Japanese artist later declared as the National Treasure of Japan. She had already shown a keen interest in these works earlier in 1962 while in Santiniketan as a Visiting Professor of art. Fuku Akino organized an exhibition of these works at the prestigious Municipal Art Gallery of Kyoto in 1973 and a special issue of Seashoku Shunju (Vol. II No. 35, Edited and Published by Happodo Co. Ltd.) was published for this occasion. The drawings were much admired and the Kyoto College of Art requested additional copies for its own collection. Even as this was being done, a major fire at the residence of Prof. Akino destroyed all these materials. Despite losing all her possessions due to the fire, she deeply regretted the loss of the drawings, and decided to make an extensive survey of Kerala mural paintings and produce a special volume on it in Japan. Thus began the second phase of survey and research. In 1974, l undertook this journey under the supervision of my teacher Prof. Anandakuttan, accompanied by Prof. Akino and a young Japanese writer called T. Kitagawa. Although we had good photographic equipments, there was no professional photographer accompanying us, though, Mr. Kitagawa managed to do a fairly good job and several of his photographs such as those on Kalamezhuttu rituals have been useful for this book Later, Prof. Akino enlarged a selection of these pictures and mounted a special show in Japan that included a printed folic A leading Japanese publisher of art books expressed interest in publishing a book on Kerala murals at this time, but withdrew when they discovered that the book's format, as envisaged by Prof. Akino, was highly ambitious and lacked commercial Viability. 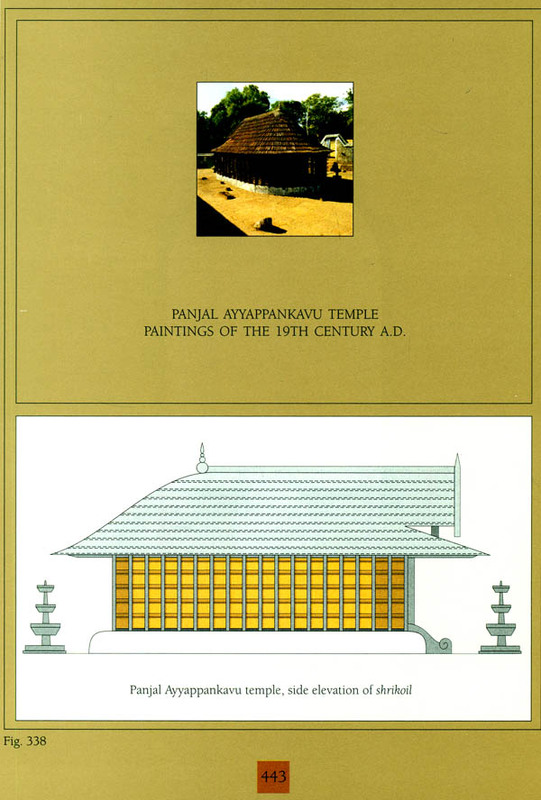 In 1986, l was again requested to produce a book on mural paintings, this time by the Department of Tourism and Culture, Government of Kerala. The director, Shri T. Balakrishnan and deputy director Shri V R. Thampi provided me with a photographer and other facilities to survey selected sites, but unfortunately history would repeat itself. The Department could not provide the funds required for the book. I visualised supported with copious illustrations, without which my presentation of a complex and visual subject would lack clarity Reproductions of images it seems to me, can often be far more important than written words . So the project on Kerala murals remained dormant for a few more years. My focus on my work as a professional artist and professor of art would also delay its desired end. It was only after my voluntary retirement from the university in 1992 that I could formulate new ways and means to complete this work. Fortunately at this time, l had begun to work in close association with Shrimati Sara Abraham of Kala Yatra who showed enormous enthusiasm. In l99l—92, she successfully organized a new survey team that included Dr. Pramod Chandra, a renowned art scholar. We were also privileged to have a photographic unit headed by Shri Appu Sista. This trip was crucial because it allowed me to discuss and re—assess my work with Dr. Chandra. 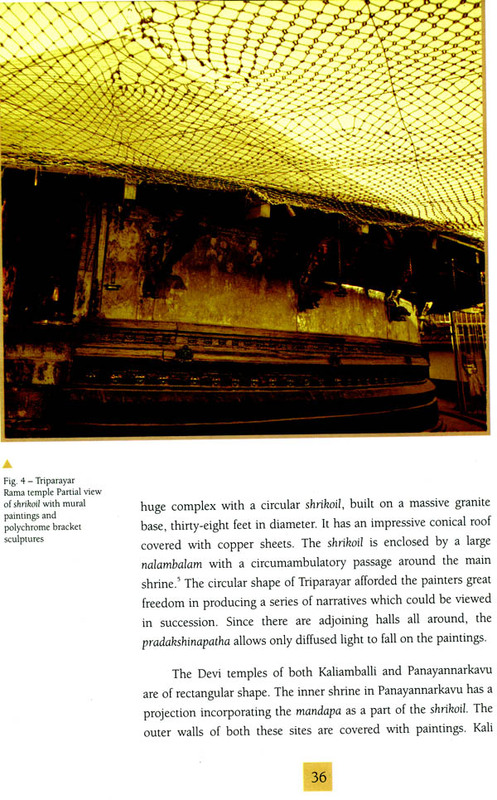 Shri Sista also did an excellent job since photographing paintings within Kerala temples is by no means an easy task. He has taken the bulk of the photographs that have been used in this book. This book is a labour of love. This study is centered on a large number of sites but does not make any comprehensive claim regarding their historicity and other details. 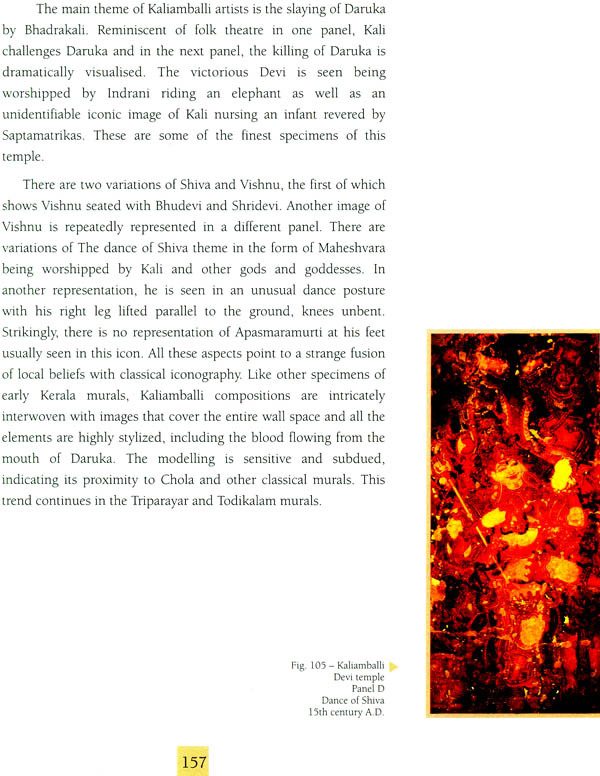 The scope of this book is mainly to bring the main characteristics of Kerala wall paintings within a single framework and to analyze the works at important sites to understand its practice, technique, and evolution. l leave it up to future generations of artists and art scholars to take up intensive research on individual sites and understand them in greater depth and context. At this stage of my life, I have no academic ambitions nor do I need any scholarly recognition. My work is based on the keen observation of an artist and I have chosen to elucidate all my points from this point of view though I hope that it is not without academic merit as it is the result of learning, thinking and practice. It has taken a long time for this book to take shape and many of the paintings discussed here may have already been lost under the relentless ‘renovation’, of varnish paints and whitewashes. My career as an artist began as a rebellious but committed painter. The teachings of my guru Ram Kinkar and the Mexican murals influenced my art initially but the mural paintings of Kerala brought about a total change in my perception, and finally led to my renewal and resurrection as an artist. The eternal beauty and depth of our traditions gradually filled me with its fragrance, penetrating the blood in my veins. Today I know that my strength as an artist is based on my understanding of my own tradition and culture. This book is primarily on art, the art of the muralist. I have concentrated on the pictorial language of our ancestors, tracing its evolution and decline rather than elaborate documentation. The strength and weakness of this book spring from this awareness. I am thankful to the Archaeological Survey of India (New Delhi), State Archaeology Department of Kerala. 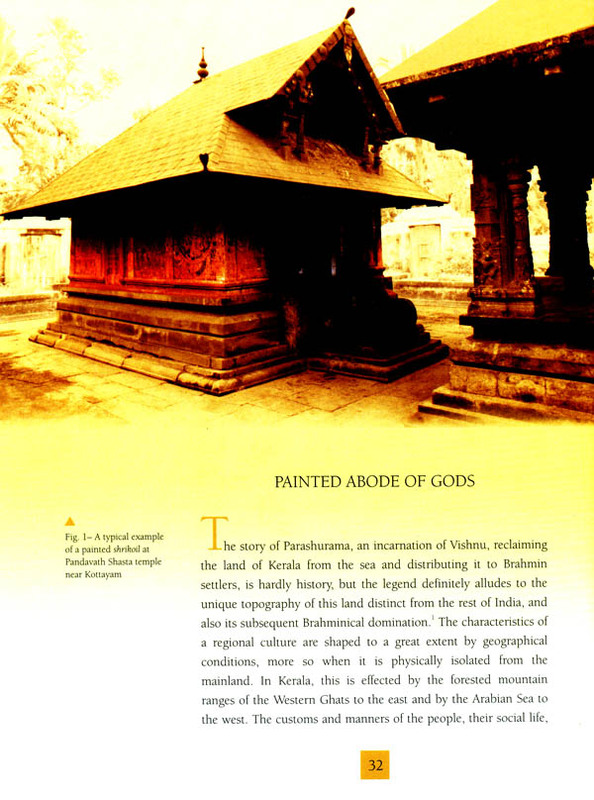 Department of Tourism (Government of Kerala), Devaswom Board, temple trustees and private owners of temples whose cooperation in documenting these murals must be acknowledged. I feel sad that many of my teachers and friends who were closely associated with this project are no longer here to see this book, including Prof. Fuku Akino, Prof. V Anandakuttan, Shri C. N. Sreekantan Nair, Shri G. Aravindan and Shri N. Mohanan. I am very grateful to my friend Shri V R. Thampi for rendering his lifelong support to this work. I wish to thank Shrimati Sara Abraham, Dr. Pramod Chandra, and Shri G. Gopa Kumar for their great help and encouragement. Shrimati Rupika Chawla who joined the last survey tour I took in 1998 with my wife Chameli helped me to assess the techniques and pigments used. My former student Deshraj took great pains in helping me overcome technical difficulties to design and produce this book. Shrimati Ella Datta provided invaluable assistance in editing and proofreading the text. I would also like to thank my daughter Sujata who painstakingly revised earlier drafts of the text and prepared the bibliography and glossary. The publication of this book would not have been possible without the active support of Shri Arun Vadehra, director of Vadehra Art Gallery New Delhi. I am indebted to Dr. Kalyan Chakravarty Member Secretary Indira Gandhi National Centre for Arts, New Delhi, for undertaking its publication. Finally l would like to thank Chameli, partner of my life and my creative work. Indira Gandhi National Centre for Arts & Aryan Books International.